During the excavation in June, archaeologists found two new panels of a mosaic floor in a Late Roman (fifth-century) synagogue at Huqoq, an ancient Jewish village. One panel showed Noah's ark with pairs of animals, such as lions, leopards and bears. The other panel depicted soldiers being swallowed by large fish, surrounded by overturned chariots in the parting of the Red Sea. "I know of only two other scenes of the parting of the Red Sea in ancient synagogues," Magness told National Geographic. 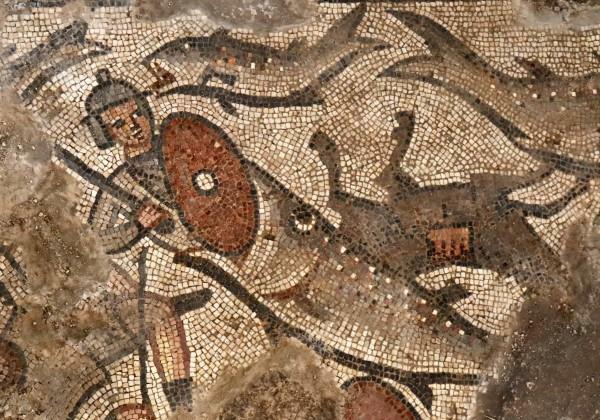 "One is in the wall paintings at Dura Europos [in Syria], which is a complete scene but different from ours — no fish devouring the Egyptian soldiers," Magness said. "The other is at Wadi Hamam [in Israel], but that's very fragmentary and poorly preserved." The ark scenes are also uncommon; Magness said she knows of only two other mosaics showing such depictions. Along with a team of university scholars and students, and the Israel Antiquities Authority, Magness has excavated at Huqoq since 2012. Previous mosaic discoveries have depicted Bible scenes such as Samson and the foxes and Samson carrying the gate of Gaza on his shoulders. The Huqoq excavations revealed the first nonbiblical mosaic found in an ancient synagogue. That three-tiered mosaic included a scene showing a meeting between two important male figures, thought to be the legendary meeting between Alexander the Great and the Jewish high priest. These previous discoveries were uncovered in the synagogue's eastern aisle, and the researchers were uncertain whether the mosaics would continue into the nave, the large central area of the synagogue. However, the excavations did, indeed, reveal the Red Sea and Noah's ark mosaics. "This panel is exactly as it should be," Magness said of the ark mosaic. "It's facing north, so people could see it as they entered from the south," where the main door would have been located. Excavations at this site also uncovered coins spanning 2,300 years. "The ancient coins … are critical for our knowledge of the monumental synagogue and the associated village," Nathan Elkins, a member of the research team and a professor of art history at Baylor University, said in a statement. As is the case after each excavation season, the researchers will remove the uncovered mosaics for conservation and backfill the excavated areas. Excavations are scheduled to continue in the summer of 2017.